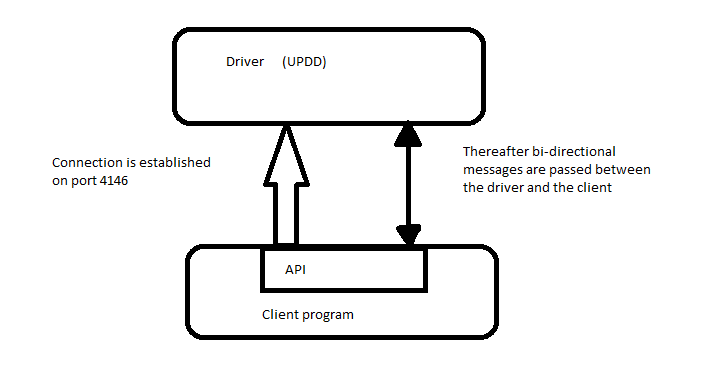 The connection between the API and the driver is implemented using TCP/IP. This provides an IPC (inter process communication) method that is portable to all supported operating systems. UPDD supports client programs by way of the API interface. Client programs are UPDD supplied utilities and add-ons, such as UPDD Calibrate, UPDD Gestures, UPDD Daemon, UPDD Test etc; or 3rd party applications using the API. The TCP/IP interface also provides the basis for an advanced feature Touch over IP. The basic topology is as shown below. In TCP/IP terminology the driver is a server. It listens (waits for) connections from client programs on a specific port. By default this is port 4146. No special configuration is required if (as is normally the case) both the client program and the driver are on the same computer. Multiple client programs can connect to the driver at the same time.